Lord's Mail is a Creation that adds the eponymous Lord's Mail armor. It was released on November 30, 2017 for 300 CC Credits. This Creation adds the quest Gift of Kynareth, which is automatically added to your journal upon installation. 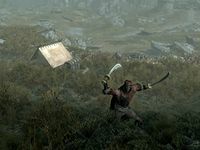 The quest directs you to Castle Dour in Solitude to steal a letter, which will lead you to a camp of Alik'r mercenaries in Whiterun Hold. However, the Lord's Mail is cursed and you will need to return to Solitude to seek the blessing of Kynareth at the Temple of the Divines. The armor itself is heavy ebony with a constant health drain effect for enemies who get into range. This Creation received an update in February 2019 which modified the Lord's Mail armor texture and made the new Redguard outfits available at Radiant Raiment. This page was last modified on 13 March 2019, at 20:48.